Gore Verbinski, the man originally tapped to direct the BioShock feature film, says the project fell apart because he couldn't get backing for it as an R-rated movie. It was almost three years ago that Take-Two Interactive announced the planned BioShock film with none other than Pirates of the Caribbean director Gore Verbinski at the helm. Verbinski signaled some serious commitment to the project in April 2009 when he passed on the fourth Pirates flick so he could do BioShock instead. But then it all fell apart; a skyrocketing budget put everything on hold and in August 2009, Verbinski dropped out after Paramount decided to film on cheaper locations overseas. "I couldn't really get past anybody that would spend the money that it would take to do it and keep an R rating. Alternately, I wasn't really interested in pursuing a PG-13 version," he explained in an interview with ComingSoon.net "Because the R rating is inherent. Little Sisters and injections and the whole thing." "I just wanted to really, really make it a movie where, four days later, you're still shivering and going, 'Jesus Christ! '," he continued. "It's a movie that has to be really, really scary, but you also have to create a whole underwater world, so the price tag is high. We just didn't have any takers on an R-rated movie with that price tag." He also thinks BioShock would be a perfect fit for the latest trend to grip the film industry: the third dimension. 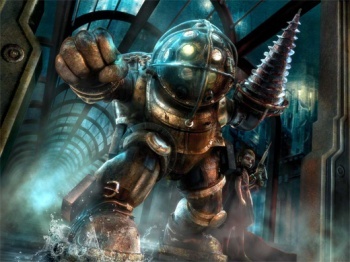 "[Bioshock] would be a great movie to do in 3D," he added. "I'd like to go into that world wearing a pair of glasses. I think in general, gaming is perfect for 3D. Anything where you're the protagonist. The kid in The Shining on the big wheel, going around corridors. That's what 3D is perfect for. To make people feel on-edge." I'm not a huge fan of Verbinski's work but his vision for BioShock certainly sounds preferable to the likely alternative: a CGI-heavy mid-budget flick with a heroic lead and a happy ending. That's if it gets made at all; the last we heard, the project was still trapped in budgetary limbo.